Celebrate the sweet, colorful side of the holidays with our Merry Chirstmas Combo Pack. This fluttery mix of texture and shape would create beautiful bouquets for your next special event. 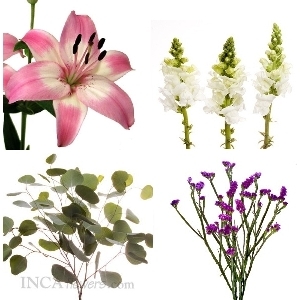 The Baby Eucalyptus is a peaceful green, acting as the backdrop for Purple Statice, White Snapdragons, and White and Pink Asiatic Lilies. This package features 16 growers bunches of the mentioned flowers. Christmas Combo Packs are available December through mid January. This package is seasonal and the exact dates may vary. 5 grower's bunches of white and pink Asiatic Lilies, averaging 10 stems per bunch. 5 grower's bunches of white Snapdragons, averaging 10 stems per bunch. 3 grower's bunches of purple Statice, averaging 10 stems per bunch. 3 grower's bunches of Baby Eucalyptus, averaging 10 stems per bunch.